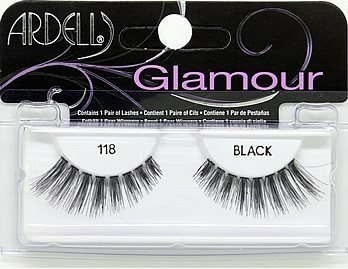 Ardell false eyelash style #113 are full and beautifully curled false lashes with curled wispy flair to accentuate the eyes for feminine sultry look. This criss-crossed pattern style falsies resembles a longer, denser, curled version of Ardell #122 lashes. New* Black/White Tray (Professional Wispies Eyelashes) Packaging. Dramatically long blunt cut lashes. Great for dance or stage performances. Enhanced volume and length with 3/4 inch lashes. Full, long lash strands. Also try Elise 013, 038, and 019. Long, yet subtle false eyelashes. Just long enough to make your eyes pop, without being obvious. Available in black and brown. Ardell Fashion lashes #117 are handmade natural looking style falsies lashes that are full and beautifully curved lashes with added volume for glamorous look! Comparable to Bullseye AMY lashes. Natural looking, full, curved lashes with added volume. Ardell Fashion lashes #118 are made from 100% sterilized human hair. This false eyelash style is long, full, and blends naturally with your own lashes. Strip lashes are easy to apply. Long, graduated strands of lashes, with medium volume. Great for making 'Cat Eyes'! False eyelash style #120 Demi has full and lengthy lashes. This style resembles InvisiBands Demi Wispies lashes. Comparable to Bullseye JOAN lashes. False eyelash style #120 Demi has full and lengthy lashes. This criss-cross style lashes have uneven, voluminous strands of lashes providing a wide eye look. This style resembles InvisiBands Demi Wispies lashes.